We are Jenny & Matt Clarke and we both grew up with dogs. Jenny’s childhood playmate was Nicky the Golden Retriever and there started the love of the breed. 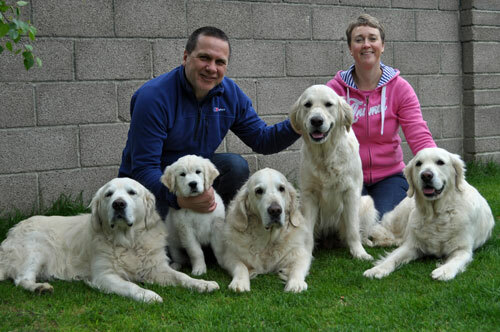 We obtained our first Golden together in 1996 from the Leighsham Kennel and spent many years partaking in obedience, agility and even trying our hand at flyball. In 2006, Bramblebriar Coachman at Sunnyoak (Sonny) entered our home and we tentatively began our show careers together. We have now obtained entries in the Kennel Clubs Stud Book with 2 dogs. All our show dogs have regularly qualified for Crufts and have won several prizes at Crufts. 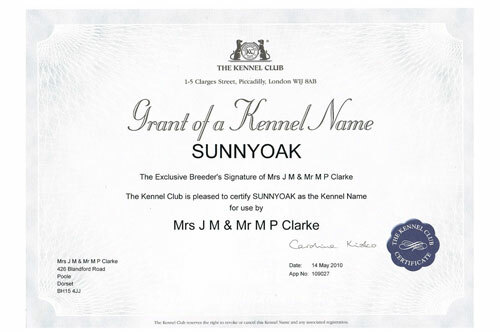 We were granted the affix “Sunnyoak” by the Kennel Club in 2010 and have had 5 litters to date. Jenny is on the Judges C List of the Golden Retriever Club, South Western GRC, Southern Golden Retriever Society, Eastern Counties GRC, The Golden Retriever Club of Wales, Midland GRC & Northern GRA. Jenny has been a Pets As Therapy Volunteer for 9 years and is a Pets As Therapy qualified Temperament Assessor. Four of our dogs are registered Pets As Therapy Dogs. Jenny is a qualified Teaching Assistant & Emotional Literacy Support Assistant. Jenny is currently Treasurer of the South Western Golden Retriever Club. 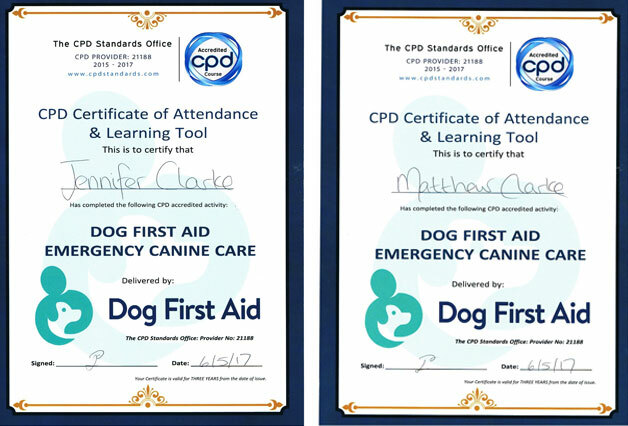 We both have current canine first aid certificates.